This is one of those cookies that you crave – especially if you are a lover of the flavor of almonds. It is buttery and crunchy but with a soft, dense middle. We make them for parties, holidays and anytime someone requests them because they come together quickly as long as you have a couple bottles of almond extract in the pantry. 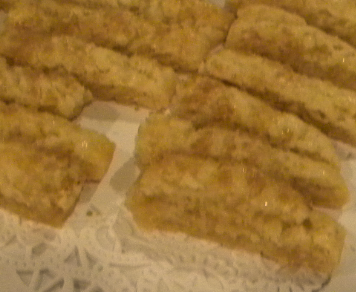 At events, we call them biscotti because that’s what they look like, but they are actually Mandel Kakor, also known as Swedish Almond Butter Cookies and we found the recipe in Relish magazine a few years ago. In a large bowl of an electric mixer combine butter and sugar, mixing at medium-high speed until light and creamy. Add flour, baking powder and salt and beat well. Add almond extract and heavy cream and mix well. Turn the dough out, roll it into a ball and cut it into four equal portions. Shape each portion into a ball then flatten each ball into a 4-inch disc, wrap in plastic and refrigerate for about 10 minutes. each top with the beaten egg and sprinkle with coarse or raw sugar. Bake 20 minutes and remove from the oven. Turn the heat down to 300 degrees. Now cut each round into 8 to 10 slices, then cut the round across to make 16 or 20 slices. Return to the oven and bake ten more minutes for chewy cookies or 20 more minutes for crispy cookies. Makes about 64 to 80 cookies. The recipe you have reprinted is incorrect. They have updated it on the relish.com website. It now calls for 1 ounce not 2 of almond extract. Makes a huge difference! tasting them, live it up and use 2 oz!